For companies in need of streamlined scheduling, Payentry’s time & attendance software is the answer. From our Timekeeping Portal you can manage timecard approvals, time entries, assigned schedules, and even view detailed reports with real-time attendance data. Plus, with our integrated time-off features, there’s no more trying to reconcile time-off requests with scheduling. With a few clicks you can approve requests for time-off, track different categories of time-off, see historical data for an employee, and more. 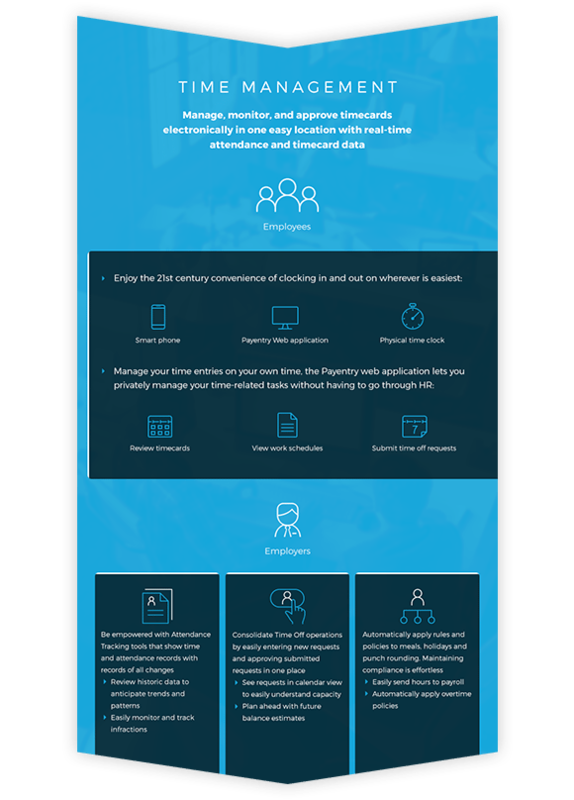 Whether you need time and attendance software designed for a small business or are looking for a solution tailored to larger companies, Payentry has you covered. With Payentry’s in-depth time & attendance software, your Human Resources department is always in the loop. When it comes to scheduling, data is everything; Payentry ensures that all your relevant employee data regarding scheduling, recorded hours, and previous time-off requests are all just a few clicks away. Within Payentry’s system, employees are able to view and update their information online at any time. This flexibility allows employees to record their time using multiple methods, resulting in increased productivity and reduced expenses.